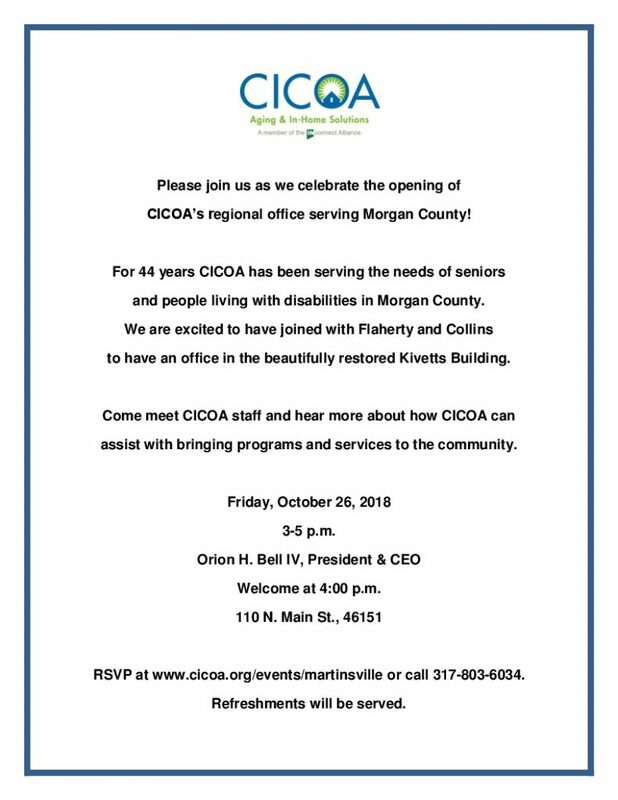 MARTINSVILLE (September 26, 2018) – CICOA Aging & In-Home Solutions has served the residents of Morgan County for more than 44 years, but now the nonprofit has a physical office in the heart of Martinsville bringing more access to low-income seniors and people with disabilities. Local residents are invited to an open house to see the space on Friday, Oct. 26, 3-5 p.m. To attend, register online at www.cicoa.org/events/martinsville or call 317.803.6034. The office is in the former Kivett’s Five and Dime at 110 N. Main St., a space it shares with The Retreat at Mineral Springs, a 38-unit apartment complex for people 55 and older. The apartments and office space opened this summer as part of the revitalization of three historic downtown structures – Kivett’s, the historic Martinsville Sanitarium (Kennedy Home) and the Morgan County Sheriff’s Residence and Jail. CICOA occupies a portion of the first floor, where it provides aging and disability resources to those who live in the apartments and those who live in and around Morgan County. CICOA staff offer by-appointment consultations at the new site effective immediately. People may get more information or schedule an appointment by calling the Aging & Disability Resource Center at 317.803.6131. CICOA Aging & In-Home Solutions is a nonprofit organization and the designated Aging and Disability Resource Center serving Central Indiana. CICOA provides a wide range of services for older adults, people with disabilities and family caregivers, including care management, home health care, home-delivered and neighborhood meals, transportation, home accessibility modifications, respite care and caregiver assistance.